For comparative images, please download leaflet. “The German Museum Coup”, in The Connoisseur, 199, 1978, p. 64 (illustrated). Pope-Hennessy, Italian Gothic Sculpture, London, 1955, nos. 36-39. Pope-Hennessy, Catalogue of Italian Sculpture in the Victoria and Albert Museum, London, 1964, vol. 1, pp. 31sq. & vol. 3, pl. 31. Bracons i Clapés, “Lupo di Francesco, mestre pisà, autor del sepulcre de Santa Eulàlia”, in D’Art: Revista del Departament d’Historia de l’Arte, no. 19 (1993), pp. 43-52. Polzer, “S. Maria della Spina, Giovanni Pisano and Lupo di Francesco”, in Artibus et Historiae, vol. 26, no. 51 (2005), pp. 9-36. Colucci, “Scultura gotica senese: aggiunte e precisazioni”, in Prospettiva, no. 130/31 (April-July 2008), pp. 161-67. Kreytenberg, “Ein Unpubliziertes Fragment vom Grabmal für Kardinal Luca Fieschi von Lupo di Francesco und ein Neuer Vorschlag zur Rekonstruktion des Monuments”, in Mitteilungen des Kunsthistorischen Institutes in Florenz, vol. 56, no. 2 (2014), pp. 152-69. Tartuferi, G. Tormen (eds. ), La Fortuna dei Primitivi: Tesori d’arte dalle collezioni italiane fra sette e ottocento, Florence, 2014, pp. 296-97. 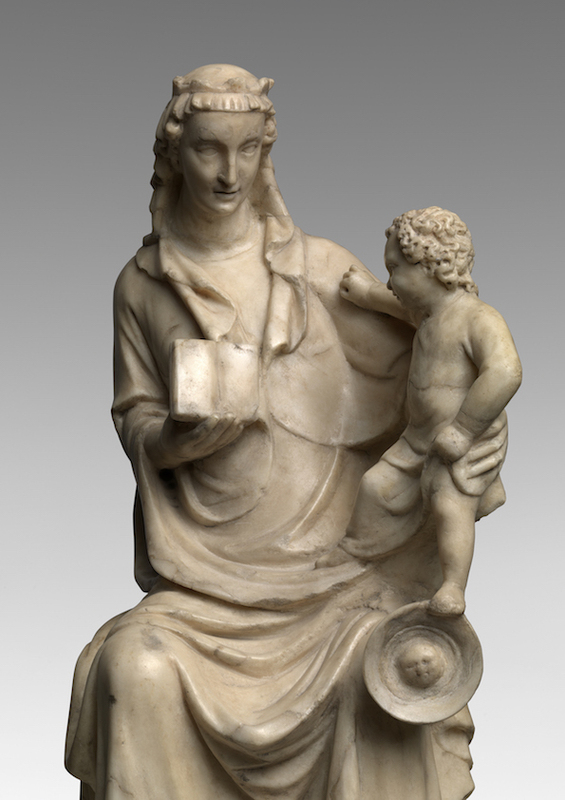 This finely carved Virgin and Child attests to the advance of the arts – and of sculpture in particular – towards the tenderer and more ornamental initial phases of Tuscan Gothic. The results, stemming from seminal innovations introduced by masters such as Giovanni Pisano (c. 1250 – c. 1315) finds multiple echoes in works of art dating from the early Trecento, as well as in paintings by the likes of Simone Martini (c. 1284 – 1344). As befits such a rare example, in the 20thCentury the Group found pride of place in the Collection of Baron Robert von Hirsch (1883-1977), one of the greatest connoisseurs of modern times. 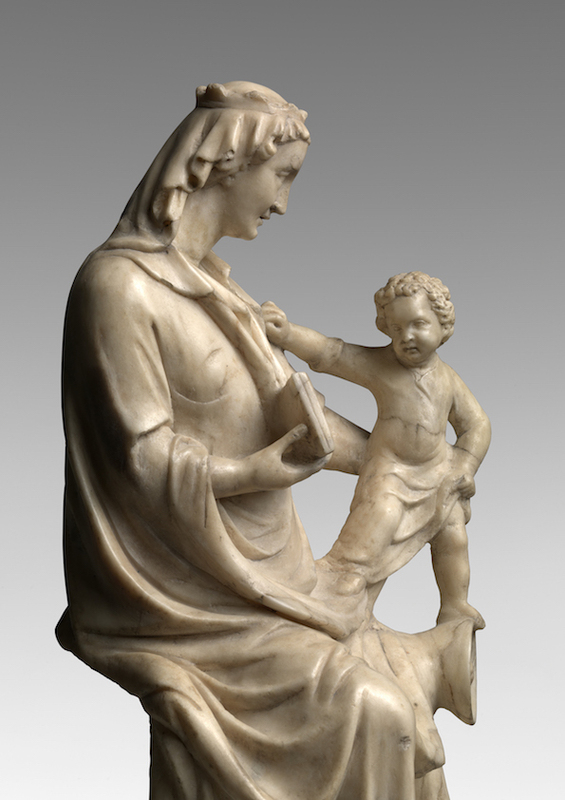 The gentle lyricism of the present Virgin and Childstrongly recalls a select corpus of Pisan sculpture which for a long time was attributed to an unknown master, later given the name of the Master of the San Michele in Borgo Pulpit. Apart from the aforementioned pulpit reliefs now in the Museo di San Matteo, Pisa (fig. 1) – the artist’s corpus comprises of the relief with the Virgin and Child with two Angelsin the Victoria and Albert Museum, London; the Tomb of the Della Gherardesca family, originally in the Church of San Francesco, Pisa, now housed between the Museo di San Matteo and the Camposanto Monumentale in the same city and, lastly, the Shrine of Saint Eulaliain the Barcelona Cathedral. In 1964, Pope-Hennessy supported the attribution of the Victoria and Albert relief (fig. 2; inv. no. 7564-1861) to the Master of the San Michele in Borgo Pulpit.1He noted the Master’s dependence not only to Pisano but also to the Master of the Gherardesca Monument. 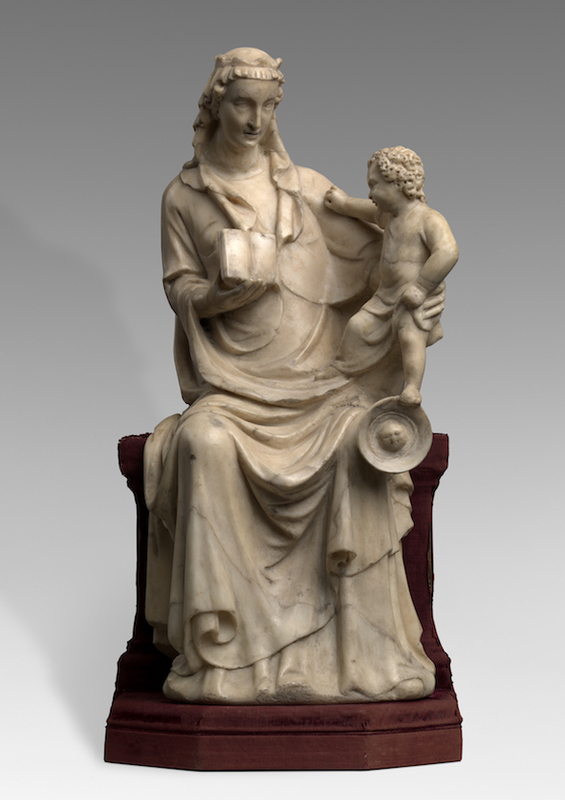 The relief depicts the Virgin on a carved seat, facing to the right with her head in profile, holding the standing Child with her left hand, an angel at each side. The coat of arms of the Orlandini family confirms that its author also worked for private commissions. It is however thanks to Bracon Clapés discovery of Lupo’s signature (“Lupo Francisci, magister lapidum”) on a document dated 1326 concerning the master of the Barcelona Cathedral, Jaume Fabre, that the nameless master “de partibus pisarum” could finally and undoubtedly be identified with Giovanni Pisano’s pupil, Lupo di Francesco.5The accepted oeuvreof the Master of the San Michele in Borgo Pulpit can therefore be brought back, on both stylistic and historical grounds, to this shadowy artist who was nonetheless one of the most respected of his time. The envoy of Lupo to Barcelona as an artistic emissary appears to be a direct consequence, and furthering of, the Pisan embassy of 1326 to contract the piece following the conquest of Sardinia by the Pisans.6The extraordinary episode in history is helpful to establish the weight and reputation of our artist in the early Trecento. As a diplomatic gift to appease the Catalans for the loss of the island, the Pisans granted his services to the city. The present marble group compares well with the Virgin and Childatop the Sepulcher of Saint Eulalia in the crypt of the Barcelona Cathedral (fig. 3). Note the delicate, supple drapery on the Barcelona Virginand the undulating carving of Her veil. In particular, observe the three folds on the front of the Barcelona Virgin’s gown, and compare with those on the right-hand side of the present Madonna (fig. 4). 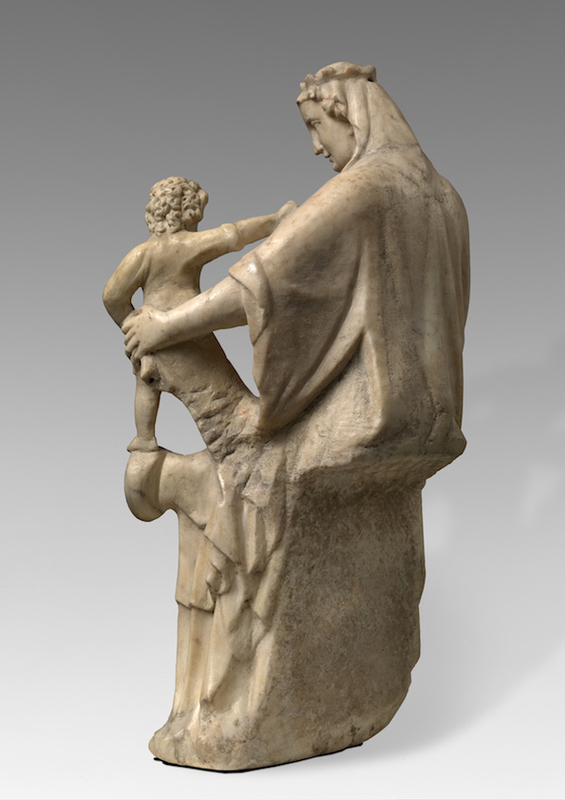 The Child’s pose, His arm lovingly touching the Mother, finds a further parallel in the group of the Virgin and Childrealized by Lupo for the Gherardesca Monument (fig. 5). Moreover, compare the elaborately carved, curly hair of the young Jesus and the drapery folds of the two standing figures on the Monument’s lower part in the Camposanto Monumentale. Finally, note the striking resemblance between our Virgin’s features, especially the pronounced almond-shaped eyes, disclosed mouth, and the relief of the Virgin in the lower register of the Monument (figs. 6 and 7). 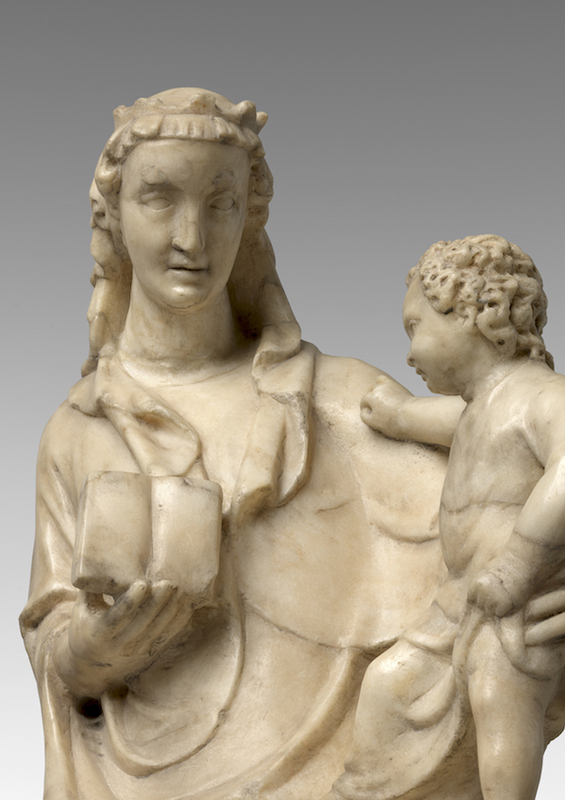 The size, quality of carving, and boldness of invention make the present group one of the most perfect surviving sculptures from early 14thcentury Tuscany still in private hands. At the time of its completion, the marble – in all likelihood meant for private devotion – would have been an incarnation of the time’s stylistic innovations in their most advanced form. The elongated torso and oval face of the Madonna cannot but recall the evolution of painting at the time as seen for instance in Simone Martini’s Maestàfrom 1315 (fig. 8). The Child’s pose, his legs balanced between the throne and the Mother’s drapery fold, the hand grasping her left arm, is strikingly unconventional and telling of Lupo’s great sensitivity to composition. It is echoed in later works such as the Madonna and Child with Saints Catherine and John the Baptist, from circa 1340-50, by the Sienese Giovanni di Agostino (Cleveland Museum of Art, Ohio). Born in Frankfrut in 1883, Robert von Hirsch made his fortune within the Offenbacher leather firm. Crucial in his development as a collector was the friendship with Georg Swarzenski (1876-1957), the one-time director of the Städelsches Kunstinstitut, met in 1905. Under his guidance, he expanded his collecting range from first editions to paintings and sculpture. The economic upheavals that engulfed Germany after the monarchy’s collapse saw a great number of aristocratic collections hitting the open market. Thus, between the late 1920s and early 1930s, von Hirsh was able to assemble an unparalleled collection of Medieval and Renaissance works of art, largely from the Princely Hohenzollern-Sigmaringen Collection, the Guelph Treasure, but also through the Hermitage sales that followed the Russian Revolution. By 1933, the political climate in Germany forced von Hirsch to relocate to Switzerland and settle in Basel.8By then, his reputation was such that museum directors and specialists from all over the world travelled to visit the villa in the Engelgasse. Bernard Berenson is reported to have said to the Swiss art historian Michael Stettler “that he had known only three collectors who really knew about the works of art that they collected, and these were the two Stoclets and Robert von Hirsch.”9Shortly after the war, he married sculptress Martha Dreyfus-Koch. The couple began collecting twentieth-century art, including works by Modigliani, Matisse and especially Cézanne, among many others. The Collection’s dispersal in 1978 – one year after his death – became the most important event of its kind in the second half of the 20thCentury. The ensemble reflected a taste and connoisseurship radicated in the 19thCentury tradition established by Sir Richard Wallace and the Rothschilds. 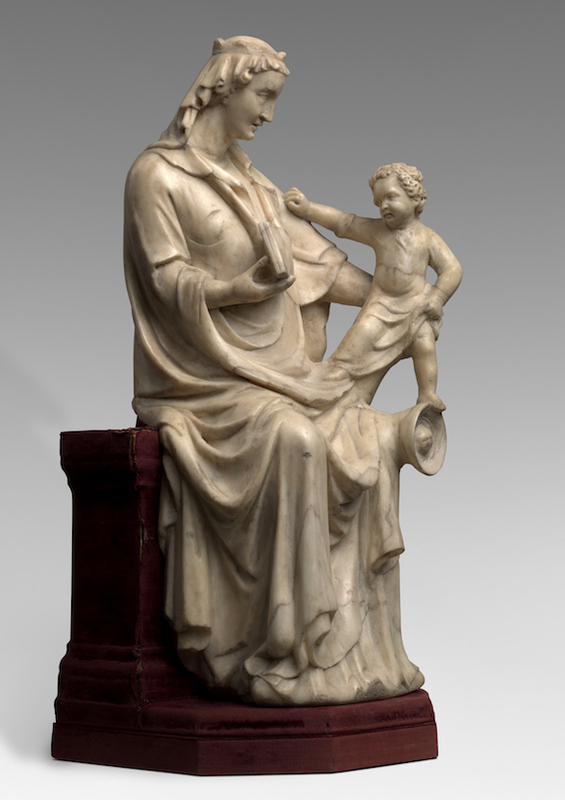 The last of its kind, the Robert von Hirsch Collection was governed by the necessity to combine beauty with extreme rarity, and in this light the acquisition of the present Madonna and Child,which was prominently displayed on the mantelpiece of the Engelgasse villa’s drawing room (fig. 10), find its perfect reason. 1J. Pope-Hennessy, op. cit., 1964, pp. 31-32. 3M. Salmi, “Un monumento della scultura pisana a Barcellona”, in Miscellanea di storia dell’arte in oronore di Igino Benvenuto Supino, Florence, 1933, pp. 125-39. 4A. Caleca, “Profilo dell’arte pisana del Trecento”, in M. Burresi (ed. ), Andrea, Nino e Tommaso scultori pisani, Milan, 1983, p. 10. 5Cf. Bracons i Clapés, op. cit., pp. 43-52. 6 Bracons i Capiés, op. cit., p. 48. 7 Cf. G. Kreytenberg, op. cit., pp. 152-69. 8 In order to emigrate, the Baron was forced to present Cranach’s Judgement of Paris to the German Nation. Returned to von Hirsch after 1945, it was later bequeathed to the Kunstmuseum Basel. 9 Cf. Sotheby’s Parke Bernet, op. cit., p. 8.